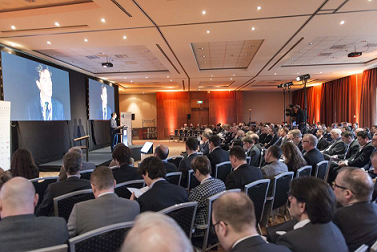 Around 300 participants gathered at Europe’s biggest aftermarket event. Connectivity and new vehicle ownership models definitely have the potential of disrupting the traditional value chain and the industry will have to adapt in order to find new collaboration models and partners and as such create new opportunities. These amongst others were clear trends identified at the 9thedition of the Aftermarket conference, organised by the European Association of Automotive Suppliers (CLEPA) in Brussels on March 21st and 22nd 2018. The audience, consisting of representatives from the European Commission and Parliament, other associations, automotive suppliers, vehicle manufacturers, wholesale distribution, trading groups and press, discussed the drivers for change and disruption within the automotive industry. Presentations and key notes from established and new players identified new technologies on vehicles and the production of parts, the change of vehicle ownership as well as upcoming new business models as main drivers for the transformation. New competences, other success factors and a different mind-set will be needed to manage the future competitive challenges with the consumer in the center. Roberto Vavassori, CLEPA President, reflecting on the conference said: “New players are on the verge of entering the automotive aftermarket sector, creating new mobility concepts. Although the real impact via e.g. electrification and connectivity is not to be expected before 2025, time is crucial, and suppliers need define their future positions as soon as possible. In general, the economic outlook for the global aftermarket business is positive but the main growth will be in the Eastern part of Europe and in Asia. The market will see less but stronger players which will drive the digitalization and new platforms are expected to play a major role in distribution of parts and assigning repair jobs to workshops. The entire automotive industry must make tremendous efforts in direction of leaner processes and the ability to make use of in-vehicle data-based services around mobility.